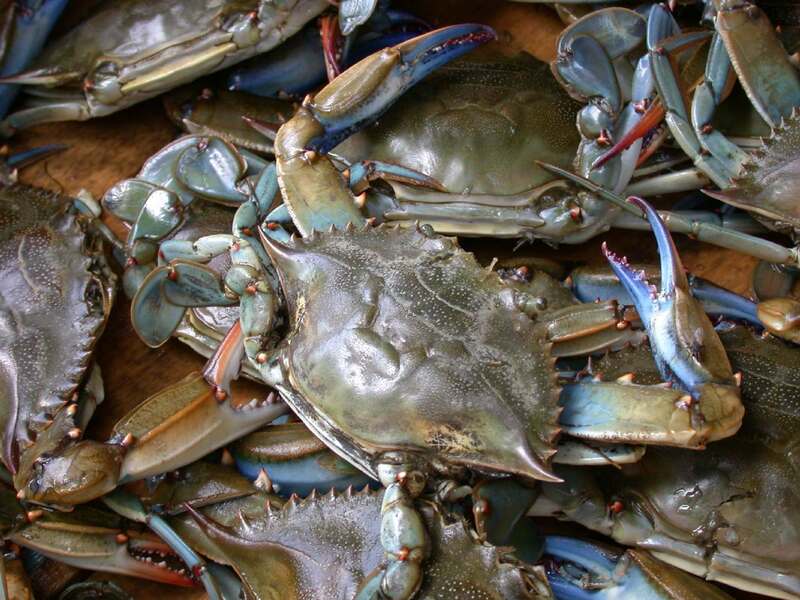 The Chesapeake Bay Foundation says President Barack Obama's decision to allow oil drilling off the coast of Virginia could endanger the blue crab and other species. The foundation says crabs float near the surface of offshore waters during their larval stage and can't escape spills. Foundation president Will Baker says a spill could destroy an entire year of newborn crabs, threatening the livelihoods of watermen and others. The foundation says the Virginia coast is as much a part of the bay ecosystem as the rivers that feed the Chesapeake. Baker says Obama's executive order last year calls for a strategy to cut bay pollution and offshore drilling is a new pollution source capable of devastating damage. NEITI: Nigeria’s Oil Production Volume Still Unknown. Classic! 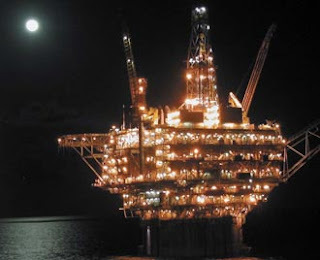 The Nigeria Extractive Industry Transparency Initiative (NEITI) has described the records of the country’s crude production and export as unclear, saying that after 58 years of oil production, the country does not know exactly the quantity it produces. Speaking at the presentation of a research report on the Nigeria Extractive Industry in Abuja weekend, Chairman of the Board of NEITI, Prof. Asisi Asobie, said despite all the inroads made by the country to expand operations in the oil industry, it had not been able to get operators to tell the truth about the actual oil volumes produced. “After 58 years of producing oil, Nigeria does not know how much was being produced. It is regrettable that we have not been able to get oil companies to tell Nigerians exactly what they produce. The sector is shrouded in secrecy,” he said. Asobie said the audit reconciliation carried out by the organisation in respect of its first and second audit report could only narrow down the discrepancies in revenue reporting to $16 million (1999-2004) and $155 million for 2005. “About $16 million are still outstanding in the accounts of oil companies with the Central Bank of Nigeria (CBN) as missing between 1999 and 2004, while $155 million is standing as un-reconciled figures in 2005,” he said. He said the outcome of NEITI’s financial audit had exposed certain weaknesses in the operations of the oil and gas industry, such as low revenue reporting, regulation, and accounting using the right parameter. The Executive Secretary of NEITI, Mallam Haruna Yanusa Sa'eed, said the body was still facilitating remediation efforts aimed at getting to the root of the outstanding N654 billion unremitted revenue by Nigerian National Petroleum Corporation (NNPC). He said representatives of the Department of Petroleum Resources (DPR) and the Federal Inland Revenue Service (FIRS) are involved in the reconciliation effort. He said NEITI had set in motion remediation strategies and NNPC had been very supportive in the sense that “we sat down with the management of the NNPC and the group managing director and a whole presentation on the areas of such weaknesses were presented. That set the ball rolling”. “We cannot say we have concluded because not all have come to light; not all have been addressed, but they are working. We are yet to recover anything from them in terms of money but we are working to recover our money,” he said. According to him, NNPC had made a claim on certain aspects of the money, saying “there is an aspect of that money which is tied in subsidy and subsidy elements; totalling about over N220 billion. These have not been fully addressed and we are working on that”. He said: “We have talked about $243 million in the areas of under-calculations in terms of royalties; about $340 billion in terms of petroleum profit tax underpayment based on the use of wrong price to determine such liabilities. There are equally issues that we are working with both FIRS and DPR to determine the net amounts payable by these companies. Sa’eed said the parties were also considering the claim by NNPC that part of the money was deployed as subsidy for petroleum products. The Executive Secretary said NEITI had been making steady inroads in the effort to encourage adoption of international best practices in the business of the petroleum production in the country. For instance, he said the organisation had commissioned a study into the issue of oil metering and what is the best practice in that regard. Complaints received by the oil companies and DPR, he said, had always been that it would not be possible to determine oil volume by just installing meters at the well head because the well head contains all the components, including water and gas. “Because of what we hear, the complaints of the companies and the complaints of the DPR have always been that it is not possible to put meters at the well heads. Because at the well heads you have everything coming from the ground, which include water, sediments, gas and everything, there has to be a point where these things are separated before you can tell how much oil is produced,” he said. He said inasmuch as these arguments are valid, what NEITI is asking is that “at what point do we know exactly what is being produced”. “Even if that cannot be done, we say let it be so done that by the time it reaches the separation point, you can tell the quality of the oil. Because if you are able to determine what quantity comes out as water, how much comes out as good crude, water and other sediments then you will be able to say the quality of the well is of this capacity,” he said. Ghana's planned $6 billion 200,000 barrels per day New Alpha refinery has secured a 20,000 barrels-per-day take-off deal in Nigeria, and is also looking to China for funds, a senior executive said on Monday. Expected to come on stream by 2015, the new refinery, which would be the biggest in West Africa, was designed to serve the local Ghanaian market, and also target the continent's top oil producer, where attacks and lack of infrastructure had severely crimped the Nigerian crude and refined oil products output. "We have concluded an off-take agreement with Ross International Nigeria Limited, based at Port Harcourt, for a 10 percent of the finished product, which is 20,000 barrels per day," Merlyn Julie, Executive Chairman of New Alpha Refinery Ghana Limited, told Reuters in an interview. "We are looking at a further off-take agreement with the River State House of Assembly government, and a US-based oil company for an additional 20 percent or 40,000 bpd," Julie said. He did not name the independent US-based oil company, but said it had links with Ross International in Houston, and expected a deal to be concluded within the next two months. Many sub-Saharan refineries are small, and analysts believe only a tiny proportion of the planned refinery projects for the region will be on stream by 2015, because of a lack of foreign funding. The region imports about 1.4 million bpd of refined products, excluding fuel oil downstream, Afican consultancy CITAC said. "There is a huge constraint on available cash flows to projects like this, although we are eliminating a lot of the risks by vigorously pursuing off-take agreements to confirm the viability of the project," Julie said. "We are also looking to the Far East, specifically China's national companies involved in this sector." He said New Alpha was also in talks with Nigeria's federal government for them to supply fuel feedstock - possibly Bonny Light crude - to the refinery, in exchange for refined products. "The exact volume hasn't been ascertained yet... the exact mix of crude blends will depend on the configuration of the refinery," Julie said of the refinery which was being designed to ramp up to 400,000 bpd if necessary. Julie said Ghana Oil Company (Goil) also expressed an interest to take a minimum of 30 percent, or 60,000 bpd, of the finished product. Ghana's 45,000 bpd Tema Oil Refinery, the country's only refining plant, was currently running at 80 percent of its capacity, due to financial problems. A pre-feasibility study for the new project, which consists of the refinery, a terminal with loading and discharging facilities, and a tank farm with pipeline infrastructure, was expected at the end of October, Julie said. The oil precinct will be sited in Ghana's Western Region, at the coastal port town of Takoradi, in close proximity to the Jubilee offshore oilfields. Ghana expects oil to generate an average annual $800 million revenue for state coffers from next year, as cash from its Tullow Oil Jubilee field starts pouring in. "The pipelines that will be linking the wells in the Jubilee Field to the mainland will be at Takoradi," said Julie. Gunmen kidnapped a Nigerian working for French oil giant Total after he left his home early Wednesday morning in the country's oil-rich delta long beset by violence, a police spokeswoman said. The man's kidnapping comes after a threat by the region's main militant group, the Movement for the Emancipation of the Niger Delta, to target the French firm. However, MEND denied taking part in the kidnapping. Police spokeswoman Rita Abbey told The Associated Press police did not immediately know who was responsible. Militants in the delta have targeted oil workers for kidnapping in the past during their campaign to bring more oil money to a region that suffered environmental damage and economic neglect over 50 years of production. However, criminal gangs increasingly target wealthy Nigerians and politicians for kidnappings. Abbey said the man was kidnapped as he drove his car outside the city of Port Harcourt around 6:30 a.m. She said investigators continued to look for clues in the attack. "We have not had any contact from the kidnappers," Abbey said. Militant groups in the Niger Delta have attacked pipelines, kidnapped petroleum company employees and fought government troops since January 2006. The attacks have increased global oil prices greatly in the past and could in the future, as Nigeria exported more than 1 million barrels of crude a day to America in December alone. President Umaru Yar'Adua negotiated a cease-fire with militants with a promise of more government oil money coming to the region. The government also began offering cash payoffs to former fighters to keep them from carrying out new attacks in the maze of creeks and oil fields running through the delta. That amnesty deal faltered after Yar'Adua became ill and hasn't been seen publicly since November. MEND detonated two car bombs March 15 during a newspaper-sponsored discussion about the amnesty program, marking what appears to be the effort's collapse. In a statement preceding the bombings, MEND warned it would attack installations and oil companies across the Niger Delta, including those of Total, who largely have avoided losses that have plagued oil giant Royal Dutch Shell PLC. However, in a statement released Wednesday, a MEND spokesman said it was not responsible for the kidnapping. "MEND does not see the Nigerian workers in Total as having any hostage value and will spare them for kidnapping," the spokesman said. HONG KONG (Dow Jones)--China Petroleum & Chemical Corp.&apos;s (SNP) refining operations remained profitable in the first quarter of this year, but high oil prices will squeeze margins below the fourth quarter&apos;s US$4 a barrel, Chief Financial Officer Wang Xinhua said Monday. Though the Beijing-based company, known as Sinopec, reported a more than doubling in 2009 net profit thanks to lower costs for much of the year and a new fuel-pricing system in China, oil prices began to rebound in the second half, jumping nearly 30% in the fourth quarter and narrowing the company&apos;s refining margins. Sinopec&apos;s refineries import more than 70% of their crude-oil needs, which had exposed the firm to heavy losses in past years when it wasn&apos;t able to recoup surging crude costs from consumers due to China&apos;s strict control over fuel prices. To lower the sensitivity of its earnings to its refining operations, Sinopec is looking to increase its crude-oil operation, announcing Sunday its first overseas acquisition of upstream assets. "In 2010, along with the recovery of the world economy, demand in the international oil market will experience recovery and growth," Chairman Su Shulin told reporters Monday in Hong Kong. "We expect the overall oil price in 2010 will be higher than that of 2009." Su said he expects Brent crude to trade between US$65 and US$95 a barrel this year. Sinopec said Sunday its 2009 net profit jumped to CNY61.8 billion (US$9.09 billion) from CNY28.5 billion in 2008 because of lower fuel costs. The strong result also came after China began linking fuel prices more closely to the international market. Under China&apos;s new resources pricing system introduced in 2009, refiners are guaranteed a 5% profit margin as long as the price of international crude is below US$80 a barrel. However, China&apos;s domestic fuel guidance prices have been frozen since November because inflation is gathering pace. China&apos;s consumer price index rose 2.7% in February, picking up from 1.5% in January and the fastest gain since November 2008. Su said that to broaden its earnings base, Sinopec is considering buying more overseas upstream assets including Addax Petroleum Corp. (AXC.T) from its state-owned parent, China Petrochemical Corp., but he didn&apos;t provide a timetable. In June, Sinopec&apos;s parent agreed to acquire oil explorer Addax Petroleum for $7.2 billion, which has a significant presence in Nigeria. "Whether or not our parent will inject more assets into Sinopec will depend on individual projects, political risks, exploration risks and the benefit that can be brought to the company," Su said. Sinopec said Sunday it agreed to acquire deep-water oil assets in Angola by buying a 55% stake in Sonangol Sinopec International Ltd. from its parent for US$2.46 billion, its first acquisition of overseas upstream assets. Su said the Angola deal will increase Sinopec&apos;s 2009 pro-forma earnings per share 2% to CNY0.721 from CNY0.707. Gordon Kwan, head of regional energy research at Mirae Asset Securities, said the deal "could just be the tip of the iceberg" as Sinopec strives to make its earnings less sensitive to the performance of its refining arm. Daiwa Securities analyst Andrew Chan said the acquisition will be the start of more asset injections from Sinopec&apos;s parent. "We see this acquisition as very positive for sentiment, and believe it may lead to a positive re-rating of the stock as it increases the company&apos;s upstream exposure," Chan said. He expects the next potential asset injection by the parent to be the Nigerian upstream assets acquired through Addax Petroleum. THE number of very large crude carriers chartered on the spot market for March loadings closed at 107 yesterday — 23 more than the same month in 2009, and just under the 108 reported in March 2007. Euronav estimates VLCC spot rates rose 92pc in 1Q. Prices are everywhere! Brussels-listed tanker owner Euronav estimates average time charter equivalent rates for very large crude carriers (VLCCs) in the Tankers International pool of vessels will be $49,000/day for this year's first quarter, a 92pc rise on the $25,500/day in the fourth quarter of last year. The full year average for VLCCs in the pool was $33,000/day in 2009. The estimate for this quarter is based on 85pc of available spot days already fixed. Euronav has 21 VLCCs and one ultra large crude carrier in the pool, which operates in the spot market. Most of the company's 19 Suezmax vessels are on long-term charter. The average rate earned by Euronav's Suezmax fleet in the first quarter is put at $31,500/day, against $29,500/day in the fourth quarter of last year and a full-year 2009 level of $31,750/day. Euronav said earlier this year it was optimistic about trading conditions for 2010 and that this could be the first year since 2003 in which the global tanker fleet contracted. Oslo-listed tanker owner Frontline last month forecast first-quarter day rates for VLCCs at $48,000/day and $32,500/day for Suezmax vessels, both figures comfortably above its forecast breakeven rates. NNPC Deploys Local Refineries Against Fuel Scarcity. Deregulation is a must! Lagos — The nation's domestic refineries, including the moribund Kaduna Refinery, have been brought back on stream to help address the recurrent scarcity of petroleum products in the domestic market. The Group Managing Director of the Nigerian National Petroleum Corporation, NNPC, Dr. Mohammed Sanusi Barkindo stated that the Kaduna Refining and Petrochemical Company (KRPC) Ltd, one of the crude processing subsidiaries of the corporation has started contributing 1.5 million litres of fuel daily. The input from the Kaduna Refinery into the market, he said, became possible after its turnaround maintenance which, he added, was executed within budget. Dr. Barkindo disclosed to members of House of Representatives Committee on Petroleum Resources (Downstream) that the completion of the turnaround maintenance of the three refineries in the country has helped the corporation to address the fuel supply and distribution challenge in the country. He decried the incessant vandalism on the nation's pipelines saying that the security of these pipelines are of national importance and urged the Committee to seek for a technology that would monitor the pipelines. the downstream sector of the petroleum industry which would ease the present fuel supply and distribution burden on the corporation. "We at the NNPC would continue to do the best we can to ensure that fuel supply and distribution reaches every nook and cranny of this country until the passage of the PIB but I must confess to you that the current situation is not sustainable considering the huge cost borne by the Corporation," Dr. Barkindo asserted. He stated that the PIB if passed would go a long way in resolving some of the structural difficulties being experienced by the corporation in running some of the refineries noting that as an appendage of government, most of them operate as cost centers. Dr. Barkindo submitted that as part of efforts to solve the lingering fuel supply and distribution challenge, the Corporation convened a stakeholders forum involving key players in the downstream sector of the petroleum industry in Lagos where all stakeholders resolved to collaborate with the NNPC to ensure efficient fuel supply and distribution in the country. He reported that the corporation formed the 'War Room' in its attempt to completely eradicate fuel queues from Lagos and Abuja initially and later other parts of the country and within three days the task force was able to minimize fuel queues. He also appealed to the legislators to act as champions of the proposed reform agenda of the petroleum sector by educating other members of the house on the import of the bill and pressurize the executive arm of government to speedily implement the deregulation policy. Responding, the Chairman, House of Representative committee on Petroleum Resources (Downstream), Hon. Clever Ikisipko assured the NNPC of his committee's readiness to support the passage of the PIB adding that with the briefing by the GMD his committee would submit its report to the house and called for regular interactions between the committee and the corporation. The previous edition of This Week In Petroleum reported negative earnings for major refiners during the fourth quarter of 2009, reflecting declining petroleum product demand and a weak economy over the past 18 months. One consequence of the sharp decline in oil demand has been the development of significant excess refining capacity and the shutdown or idling of several U.S. refineries. Two East Coast refineries have been closed in recent months; and several smaller plants have been idled, but could be brought back on line in a matter of weeks. On the other hand, a significant 180,000-barrel-per-day capacity addition at the existing Marathon refinery in Garyville, Louisiana was completed in January that will partially offset these closures. One indicator of potential industry financial performance that captures both demand and capacity is refinery utilization (calculated as gross inputs divided by operable refinery capacity). Consistent with today’s economic environment, analysts have seen the Energy Information Administration’s (EIA) refinery utilization measure drop from pre-recession levels of more than 90 percent in 2007 to rates hovering around 80 percent in recent months. 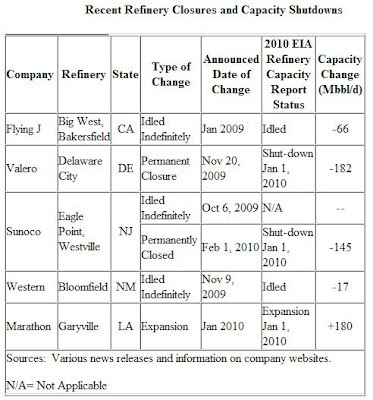 In order to properly interpret these changes, users may need to better understand EIA’s definition of refinery capacity, and be aware of timing issues related to reporting and publication cycles. Refinery capacities are collected as part of EIA’s monthly petroleum supply data, and are reflected in capacity and utilization figures in the Petroleum Supply Monthly (PSM) and Weekly Petroleum Status Report (WPSR). For ease of reporting and interpretation, the “refinery capacity” expressed here and in EIA data refers to crude oil distillation capacity alone. 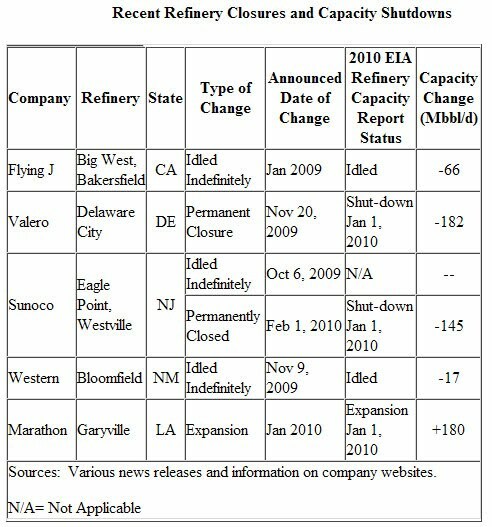 EIA reports “operable” refinery capacity, which is the sum of “operating” and “idle” capacities, in the PSM and WPSR. When permanently shut down, capacity is removed from the totals. While Western’s Bloomfield and Flying J’s Bakersfield plants are not currently operating, they fall under the official definition of “idle,” since they report that they are capable of resuming operation within 30 days, and thus are still being counted under operable capacity. Since the utilization calculation uses actual inputs to distillation (reported weekly) divided by operable capacity (lagged several months due to reporting and publication cycles), recent refinery closures can make the weekly utilization rate appear lower than if the closures were removed from the equation altogether. Also, the monthly utilization rate can change significantly from the reported weekly rate (characterized as an estimate) for the same period, since the monthly rate includes more complete input data and fully updated capacities. RPT-UPDATE 2-Shell: Motiva Norco LA refinery crude unit back up. Big news for the Gulf! Reuters) - A fire-damaged crude distillation unit (CDU) at the 236,400 barrel-per-day (bpd) Motiva Enterprises LLC joint-venture refinery in Norco, Louisiana, is back up, a company spokesman said on Monday. "We can confirm that the DU-5 unit at the Norco refinery has been successfully restarted," spokesman Ted Rolfvondenbaumen said. He said the unit restarted on Friday. Shell Oil Co (RDSa.L) had said earlier this month that Motiva was close to finishing repairs from a Jan. 22 fire and hoped to restart the unit by the end of March. The previous target had been early April. A CDU performs the initial refining of oil that comes to a refinery, providing the feedstock for other units that produce finished motor fuels. A company spokesman did not immediately respond to a requestfor comment. close to dated plus $1.20. 20 cents but potential buyers closer to minus 50 cents. will be valid until April 1 when the tender will close. Reliance to tighten grip on world fuel markets. Africa not front runner! production at its giant complex, further stamping its mark on world markets. To maximise profit margins with its sophisticated refining capability, Reliance Industries is also set to limit African crude imports this year in favour of Middle East grades, if light crude prices continue to strengthen against heavy-sour grades, traders and analysts said. "I expect Reliance refineries to run at full steam, even if in between there is a small shutdown, they can easily run at about 65 million tonnes," said a trader familiar with refining operations. Reliance declined comment on traders' estimates. This means that the company's two refineries -- the largest facility in the world -- will run above their full combined capacity of 1.24 million barrels per day (bpd), higher than last year when its second plant began operating at full rate in the second half. After the world first saw increasing flows from Reliance in the summer of 2008, with the start of its new 580,000 barrel-per-day (bpd) plant, this year will see the full blast of exports of high-value diesel and gasoline made from a diverse slate of the cheapest available crudes. This will put pressure on weak Western refineries and arbitrage traders at a time oil demand is just starting to pick up, but is still in defensive mode, analysts said. OPEC Output Falls From a 14-Month High, Survey Shows. Output fell 30,000 barrels a day, or 0.1 percent, to an average 29.205 million barrels a day, according to the survey of oil companies, producers and analysts. Members with production quotas, all except Iraq, raised output by 55,000 barrels to 26.84 million barrels a day, the highest level since December 2008 and 1.995 million above their target. OPEC cut its quotas by 4.2 million barrels to 24.845 million barrels a day beginning in January 2009 as fuel demand tumbled during the worst recession since World War II. The group left the targets unchanged at a meeting March 17 in Vienna. “With oil near $82 it’s going to be hard to get them to cut back by much,” said Michael Lynch, president of Strategic Energy & Economic Research in Winchester, Massachusetts. Compliance among the 11 members with output quotas fell to 53 percent in March from 54 percent in February. All members exceeded their production limits. Last month’s total for all members was the highest since December 2008. Crude oil has risen 14 percent since the end of January to $83.45 a barrel at 12:45 p.m. on the New York Mercantile Exchange. Iraqi output dropped 85,000 barrels a day to 2.365 million in March, the biggest decrease in OPEC. February production was revised 65,000 barrels a day higher. Nigeria’s production rose 70,000 barrels to 2.01 million barrels a day, the largest increase in the group. Africa’s biggest oil producer exceeded its target by 337,000 barrels a day. Attacks by the Movement for the Emancipation of the Niger Delta and other armed groups on Nigeria’s oil industry have cut the nation’s exports by more than 20 percent since 2006. Saudi Arabia, OPEC’s biggest producer, lowered output by 50,000 barrels to 8.2 million barrels a day, the second-biggest reduction in the group. The kingdom exceeded its quota by 149,000 barrels a day. Algeria, Angola and Venezuela each curbed output by 10,000 barrels a day, the survey showed. Venezuelan production slipped to 2.19 million barrels a day in March. Production in Iran, OPEC’s second-biggest producer, increased 30,000 barrels a day to 3.825 million, the highest level since December 2008. The country is the biggest overproducer in the group, exceeding its quota by 489,000 barrels a day. The United Arab Emirates, OPEC’s fourth-largest producer, bolstered output by 20,000 barrels to 2.3 million barrels a day, putting the country 77,000 barrels a day above its target. It was the third-biggest gain after Nigeria and Iran. To contact the reporters on this story: Mark Shenk and Karyn Peterson in New York at mshenk1@bloomberg.net. ABUJA (Reuters) - The United States embassy in Nigeria said Wednesday it had raised its security alert status because of "continuing worldwide terrorist threats against U.S. citizens." An email sent to Americans living in Nigeria did not give details of the threats. "Due to continuing worldwide terrorist threats against U.S. citizens, U.S. government facilities, and U.S. interests, the U.S. Mission in Nigeria, which includes the U.S. Embassy in Abuja and the U.S. Consulate General in Lagos, has increased its alert status," the notice said. ABUJA, Nigeria -- Nigerian lawmakers have approved the majority of the new Cabinet proposed by Acting President Goodluck Jonathan. Senators approved a list of 38 candidates Wednesday that included former information minister Dora Akunyili. She circulated a memo to the Cabinet in February calling on it to grant then-Vice President Goodluck Jonathan powers to act on behalf of President Umaru Yar'Adua who has been ill and absent from office for months. The Cabinet also includes one of Yar'Adua's nephews. Jonathan dissolved the 42-member Cabinet on March 17, about a month after the National Assembly empowered him to become acting president in Yar'Adua's absence. It was seen as an effort to purge top officials loyal to Yar'Adua, though some were included in the new cabinet. Obama clears way for oil drilling off US coasts. WASHINGTON – Reversing a ban on oil drilling off most U.S. shores, President Barack Obama on Wednesday announced an expansive new policy that could put oil and natural gas platforms in waters along the southern Atlantic coastline, the eastern Gulf of Mexico and part of Alaska. Speaking at Andrews air base outside Washington, Obama said, "This is not a decision that I've made lightly." He addressed the expected outcry from disappointed environmentalists by saying he had studied the issue for more than a year and concluded it was the right call given the nation's voracious thirst for energy and the need to produce jobs and keep American businesses competitive. "We're announcing the expansion of offshore oil and gas exploration but in ways that balance the need to harness domestic energy resources and the need to protect America's natural resources," Obama said, according to his prepared remarks released in advance by the White House. "This announcement is part of a broader strategy that will move us from an economy that runs on fossil fuels and foreign oil to one that relies more on homegrown fuels and clean energy. And the only way this transition will succeed is if it strengthens our economy in the short term and long term." He added: "To fail to recognize this reality would be a mistake." The plan modifies a ban that for more than 20 years has limited drilling along coastal areas other than the Gulf of Mexico. It allows new oil drilling off Virginia's shoreline and considers it for a large chunk of the Atlantic seaboard. At the same time, he's rejecting some new drilling sites that had been planned in Alaska. With rusty ammo, Nigeria confronts pirates. Classic! GULF OF GUINEA, Nigeria – The gleaming Nigerian naval patrol boat heaved across the rough waters of the Atlantic Ocean in search of pirates. Beyond the crisp white hull, however, crew members in cheap sandals manned machine guns whose ammunition had rusted in the chambers. And a computer-guided gun on the bow had no ammo at all. This is the first line of defense against growing piracy off West Africa. The patrol boat Burutu, which recently participated in a training exercise with the U.S. military, is part of a force that patrols Nigeria's 530 miles (853 kilometers) of coastline. But the navy appears overmatched as attacks on shipping continue and grow more violent, and militants resume strikes on oil platforms and pipelines. The coastline of Africa's most populous country is a target-rich environment. Barges and other vessels belonging to energy companies crowd the waters off the Niger Delta, one of America's top sources of crude oil. At night off the megacity of Lagos, lights from scores of cargo ships twinkle like an archipelago as crews wait for weeks to unload at the city's busy, mismanaged port. About 10 pirates on Thursday night boarded a Turkish-flagged freighter waiting to unload its cargo. They stole money, mobile telephones and computer gear, Turkish maritime authorities said. The crew apparently fought back and sent an alarm before the pirates clubbed them with Kalashnikov rifles and stabbed the captain. Two Turkish sailors and a Nigerian worker were injured. "The Western African coast, especially around Nigeria, is a high risk area for piracy," said Cyrus Mody, a manager at the International Maritime Bureau, which tracks piracy worldwide. "It also one of the most violent places." The bureau reported 28 attacks off Nigeria during 2009 and believes at least another 30 pirate attacks went unreported, either due to companies worried about having higher insurance premiums or concerns about advertising their security weaknesses, Mody said. Attacks have occurred elsewhere along the Gulf of Guinea that Nigeria shares with more than a half-dozen other countries. On Saturday, armed pirates off Cameroon's coast near Nigeria kidnapped two sailors from a Ghanaian-flagged ship for ransom. In another attack in November near neighboring Benin by suspected Nigerian pirates, a Ukrainian sailor was shot dead. In other boardings, pirates stabbed and beat sailors, Mody said. The former British protectorate's navy includes several large ocean-cruising craft and smaller patrol boats that can travel up the Niger River in the delta to look for those attacking oil pipelines and stealing crude oil. The U.S. imported more than 1 million barrels of Nigerian crude oil a day in December, making Nigeria America's third-biggest foreign source that month, so the U.S. has an interest in seeing the Nigerian navy improve. 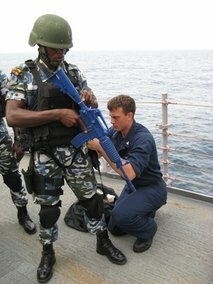 The U.S. Navy has been training naval forces of West African nations to fight piracy, even though much of the world's attention remains focused on Somali pirates operating off East Africa. Commodore David Nabaida, a spokesman for the Nigerian navy, said the navy will continue to patrol off of the Niger Delta and Lagos. He said it is difficult to protect the more than 200 ships anchored in Lagos and questioned whether freighters were actually being robbed. "Maybe ships do deals and sell their products, then say they were attacked by pirates so they can divert attention from whatever crooked deals they have done," he said. In a country permeated by corruption, it's perhaps not unusual that the commodore harbors such suspicions. The corruption that permeates every level of government in Nigeria may hamper the anti-piracy efforts. A retired Navy rear admiral was recently indicted for allegedly embezzling government funds. Nigeria's elites often plunder the oil money that should be running and building up the country and some politicians even allegedly hire criminals and militants to help them rig elections. The effectiveness of the Nigerian navy is also in question. During the recent training exercise, the Burutu was motoring near the American frigate Samuel B. Roberts. The U.S. ship sounded a warning through its loudspeaker that the Nigerian vessel was on a collision course. The warning continued even as the Nigerian patrol boat scraped along the side of the U.S. warship, creating an ear-piercing metallic squeal. One U.S. sailor cursed and threw a blue hard hat at the Nigerian sailors, who merely stared. Sinopec gets upstream foothold with $2.5 billion deal! Angola!!!!! HONG KONG (Reuters) - Sinopec (HKSE:0386.HK - News), Asia's top oil refiner, will buy a stake in upstream assets in Angola for $2.46 billion and said it wanted more such deals, which could shield it from high oil prices that hit margins in the fourth quarter. Sinopec, China's No.2 oil and gas producer after PetroChina (HKSE:0857.HK - News; NYSE:PTR - News; Shanghai:601857.SS - News), said its unit in Hong Kong would buy 55 percent of Sonangol Sinopec International Ltd, which has deepwater assets in Angola, from its parent China Petrochemical Corp, its first acquisition of overseas upstream assets. Analysts say upstream acquisitions by China's biggest refiner are necessary because it will continue to struggle in the first half of 2010, as Beijing procrastinates on raising state-set fuel prices for fear of stoking inflation. "This is a long-term positive," said Gordon Kwan, an analyst at Mirae Asset Securities. "They need the upstream assets to compete with PetroChina and CNOOC. They are the most vulnerable, without guaranteed domestic prices to secure a margin. ... They would get more upstream assets to minimize their vulnerability." Besides buying more upstream assets from its parent, Sinopec could hunt for assets in North Africa, the Caspian Sea and Latin America, Kwan said. With the Angola transaction, Sinopec's remaining proven reserves of crude oil will increase 3.6 percent and its daily crude oil production will rise 8.8 percent, the firm said. "This acquisition, of one of its parent's highest quality assets, marks the entry of Sinopec into the overseas upstream E&P (exploration and production) business, and forms the basis for the company to acquire future new oil and gas assets," the firm said in a statement. Sinopec said in a separate statement that its board had proposed to issue A-share convertible bonds that could total up to 23 billion yuan ($3.37 billion) for an ethylene project in Wuhan, and for some of its refining and pipeline projects. ID:nHKV002305]. 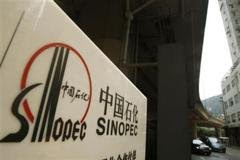 Sinopec forecast higher crude prices in 2010 and warned that more refining capacity in China could stiffen competition. Although Sinopec's fourth-quarter profit beat expectations, its results echoed a dismal theme across the sector, dragged down by higher crude prices and low state-capped fuel prices. Rival PetroChina (HKSE:0857.HK - News) said Beijing could delay fuel-price hikes as it posted a lower-than-forecast 12 percent gain in quarterly profit. "Following the recovery in the global economy, international oil market demand has recovered. It is expected that in 2010, the level of crude prices may be higher than in 2009," Sinopec said in a statement to the Shanghai stock exchange. Sinopec said that with new capacity from refining and petrochemical businesses coming on stream, market competition would remain keen. In 2010, Sinopec is targeting domestic crude oil production of 44.52 million tons. It aims to process crude oil of 203 million tons and to have total domestic sales of refined products of 129 million tons. Total capital expenditure will amount to 112 billion yuan, with about half going to exploration and production. Crude oil prices climbed nearly 30 percent in the fourth quarter from a year earlier. While that boosted profits at Sinopec's (Shanghai:600028.SS - News; NYSE:SNP - News) exploration unit, China's second-largest, it sliced the firm's refining margins as Sinopec buys more than 70 percent of its crude on the global market. Besides more fuel price hikes, Sinopec will be banking on a faster rise of the yuan in 2010, which would reduce the cost of imported crude. For Sinopec investors, the fourth-quarter results are depressingly familiar: the firm was crippled with refining losses in 2008 due to rising crude prices and low state-set fuel prices. Sinopec's (Shanghai:600028.SS - News; NYSE:SNP - News) net profit attributable to shareholders totaled 11.96 billion yuan for October-December, compared with a restated 13.46 billion yuan last year, according to a statement to the Shanghai Stock Exchange, using international accounting standards. Analysts had expected a profit of 10.4 billion yuan, according to estimates compiled by Thomson Reuters I/B/E/S. But for most of 2009, Sinopec, led by Chairman Su Shulin, benefited from lower crude prices and from Beijing raising retail fuel prices five times. The government last raised gasoline and diesel prices by 7 percent in November. Shares in Sinopec have fallen about 7.8 percent this year. PetroChina (Shanghai:601857.SS - News; NYSE:PTR - News) has lost about 6.1 percent, while CNOOC (NYSE:CEO - News), which reports on March 31, has risen 3.3 percent. IPhone App to Sidestep AT&T. I love technology! Why are my T-Mobile bills $400.00 a month then? For a little $1 iPhone app, Line2 sure has the potential to shake up an entire industry. It can save you money. It can make calls where AT&T's (T) signal is weak, like indoors. It can turn an iPod Touch into a full-blown cellphone. And it can ruin the sleep of cellphone executives everywhere. Line2 gives your iPhone a second phone number -- a second phone line, complete with its own contacts list, voice mail, and so on. The company behind it, Toktumi (get it? ), imagines that you'll distribute the Line2 number to business contacts, and your regular iPhone number to friends and family. Your second line can be an 800 number, if you wish, or you can transfer an existing number. To that end, Toktumi offers, on its Web site, a raft of Google (GOOG) Voice-ish features that are intended to help a small businesses look bigger: call screening, Do Not Disturb hours and voice mail messages sent to you as e-mail. You can create an "automated attendant" -- "Press 1 for sales," "Press 2 for accounting," and so on -- that routes incoming calls to other phone numbers. Or, if you're pretending to be a bigger business than you are, route them all to yourself. The Line2 app is a carbon copy, a visual clone, of the iPhone's own phone software. The dialing pad, your iPhone Contacts list, your recent calls list and visual voice mail all look just like the iPhone's. So you have a second line on your iPhone. But that's not the best part. Line2 also turns the iPhone into a dual-mode phone. That is, it can make and receive calls either using either the AT&T airwaves as usual, or -- now this is the best part -- over the Internet. Any time you're in a wireless hot spot, Line2 places its calls over Wi-Fi instead of AT&T's network. That's a game-changer. Where, after all, is cellphone reception generally the worst? Right -- indoors. In your house or your office building, precisely where you have Wi-Fi. Line2 in Wi-Fi means rock-solid, confident reception indoors. Line2 also runs on the iPod Touch. When you're in a Wi-Fi hot spot, your Touch is now a full-blown cellphone, and you don't owe AT&T a penny. Turns out Wi-Fi calls don't use up any AT&T minutes. You can talk all day long, without ever worrying about going over your monthly allotment of minutes. Wi-Fi calls are free forever. Well, not quite free; Line2 service costs $15 a month (after a 30-day free trial). But here's one of those cases where spending more could save you money. If you're in a Wi-Fi hot spot most of the time (at work, for example), that's an awful lot of calling you can do in Wi-Fi -- probably enough to downgrade your AT&T plan to one that gives you fewer minutes. If you're on the 900-minute or unlimited plan ($90 or $100 a month), for example, you might be able to get away with the 450-minute plan ($70). Even with Line2's fee, you're saving $5 or $15 a month. Line2 also lets you call overseas phone numbers for Skype-like rates: 2 to 5 cents a minute to most countries. (A full table of rates is available at toktumi.com.) As a handy globetrotters' bonus, calls home to numbers in the United States from overseas hot spots are free. All of these benefits come to you when you're in a Wi-Fi hot spot, because your calls are carried by the Internet instead of by AT&T. Interestingly enough, though, Line2 can also make Internet calls even when you're not in a hot spot. It can, at your option, place calls over AT&T's 3G data network, where it's available. Every iPhone plan includes unlimited use of this 3G network -- it's how your iPhone sends e-mail and surfs the Web. So once again, Line2 calls don't use up any of your monthly voice minutes. Unfortunately, voice connections on the 3G network aren't as strong and reliable as the voice or Wi-Fi methods. Cellular data networks aren't made for seamless handoffs from cell tower to tower as you drive, for example -- there's not much need for it if you're just doing e-mail and Web -- so dropped calls are more likely. Fortunately, if you're on a 3G data-network call and you walk into a hot spot, Line2 switches to the more reliable Wi-Fi network seamlessly, in midcall. Whenever you do have an Internet connection -- either Wi-Fi or a strong 3G area -- you're in for a startling treat. If you and your calling partner are both Line2 subscribers, Line2 kicks you into superhigh audio-quality mode (16-bit mode, as the techies call it). Your calling partners sound as if they're speaking right into the mike at an FM radio station. It's almost too clear; you hear the other person's breathing, lip smacks, clothing rustling and so on. After years of suffering through awful cellphone audio, it's quite a revelation to hear what you've been missing. Now, this all sounds wonderful, and Line2 generally is wonderful. But there's room for improvement. First, as you've no doubt already concluded, understanding Line2 is complicated. You have three different ways to make calls, each with pros and cons. There's a faint hiss on Line2 calls, as if you're on a long-distance call in 1970. The company says that it deliberately introduces this "comfort noise" to reassure you that you're still connected, but it's unnecessary. And sometimes there's a voice delay of a half-second or so (of course, you sometimes get that on regular cellphone calls, too). Finally, a note about incoming calls. If the Line2 app is open at the time, you're connected via Wi-Fi, if available. If it's not running, the call comes in through AT&T, so you lose the benefits of Wi-Fi calling. In short, until Apple blesses the iPhone with multitasking software, you have to leave Line2 open whenever you put the phone to sleep. That's awkward. Still, Line2 is the first app that can receive incoming calls via either Wi-Fi or cellular voice, so you get the call even if the app isn't running. That's one of several advantages that distinguish it from other voice-over-Internet apps like Skype and TruPhone. Another example: If you're on a Wi-Fi call using those other programs, and someone calls your regular iPhone number, your first call is unceremoniously disconnected. Line2, on the other hand, offers you the chance to decline the incoming call without losing your Wi-Fi call. Those rival apps also lack Line2's call-management features, visual voice mail and conference calling with up to 20 other people. And Line2 is the only app that gives you a choice of call methods for incoming and outgoing calls. All of this should rattle cell industry executives, because let's face it: the Internet tends to make things free. Cell carriers go through life hoping nobody notices the cellephant in the room: that once everybody starts making free calls over the Internet, it's Game Over for the dollars-for-minutes model. Line2, however, brings us one big step closer to that very future. It's going to be a wild ride. Canadian Oil-Sands Exporters Expand In US Gulf Market: US Market is growing!!!!! OTTAWA (Dow Jones)--Canadian producers of crude from oil sands are making a big push into the U.S. Gulf Coast market, where refiners are paying the highest prices in decades for low quality, high-sulfur oil. Historically, Canadian high-sulfur, or "heavy," crude, shipped by long-distance pipeline, has struggled to compete against cheaper, seaborne shipments of oil from Mexico, Saudi Arabia and Venezuela. But Mexico&apos;s heavy-crude output is declining and Venezuelan exports of the stuff to the U.S. have dropped amid a rocky political relationship between the two nations. Saudi Arabia, meanwhile, also has cut exports of high-sulfur crude, which is less profitable than lighter varieties, as part of broader cuts by the Organization of Petroleum Exporting Countries. Reduced competition and higher prices for Canadian crude come at a good time for Alberta&apos;s oil-sands industry, which is expected to double production within the next 10 years to 3.1 million barrels a day and requires new markets to soak up the growing output. While Canada supplies a quarter of U.S. oil imports, only 2.2% of the crude refined in the Gulf Coast region--which has the lion&apos;s share of U.S. heavy-crude refining capacity--came from north of the border last year. "We think there&apos;s an opportunity for Canadian companies to gain more market share in the Gulf market," said Alberta Energy Department Assistant Deputy Minister Mike Ekelund, who is in charge of the province&apos;s resource strategy. "We&apos;re a supplier that&apos;s right next door, we&apos;re relatively politically stable, and we think there&apos;s a great deal of benefit for Americans in terms of having a secure access to supply." Canadian producers are adjusting their plans to take better advantage of the shift in the U.S. market. Syncrude, the largest Canadian oil-sands project, changed its growth plans last month, saying future expansions won&apos;t include upgraders to covert heavy oil into lighter products, but instead will sell the raw product into the U.S. market. 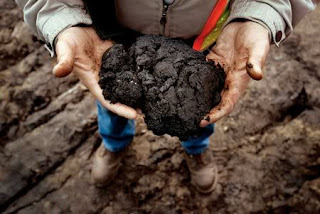 Syncrude is a joint venture operated by Canadian Oil Sands Trust (COSWF, COS.UN.T), Imperial Oil Ltd. (IMO, IMO.T), Suncor Energy Inc. (SU, SU.T), ConocoPhillips (COP), Nexen Inc. (NXY, NXY.T), Murphy Oil Corp. (MUR) and Mocal Energy, a unit of Japan&apos;s Nippon Oil Corp. (5001.TO). Changes in the oil industry abroad are behind the U.S. market shift. Mexico&apos;s heavy crude oil is in decline due to waning production from its giant Cantarell offshore field in the Gulf of Mexico, and exports to the U.S. declined to 1.24 million barrels per day last year, down 28% from their peak in 2006. In Venezuela, production has been in decline due to political instability and lack of new investment. President Hugo Chavez also has begun to send a fraction of his country&apos;s crude exports away from the U.S. to the Chinese market, and has cut exports in recent months to meet OPEC mandates. U.S. imports from Venezuela have dropped to under 900,000 barrels a day in recent months, cut in half from peak rates during the 1990s and down a quarter from 2008. Meanwhile, other OPEC exporters, mandated to cut production to keep prices high amid lower world demand, have cut production of less-profitable heavy crude first. Saudi Arabia reduced imports to the U.S. to under 1 million barrels a day, down a third from 2008, with most of the reduction in heavy crude. As the Gulf Coast&apos;s regular supplies of heavy crude oil have declined, the price for it has shot up, as Gulf refiners--heavily invested in the heavy-oil cokers used to break the stuff into lighter grades--are willing to pay more to keep their facilities running. Canadian Natural Resources Inc. (CNQ), a large Canadian oil and gas company with significant production of heavy crude from the oil sands region, said the Canadian heavy-oil discount to West Texas Intermediate crude dropped to an average of 16% during the fourth quarter. "Historically the heavy-oil differentials have been in that 30% to 45% range, averaging about 32%," Canadian Natural President Steve Laut said during the company&apos;s fourth-quarter conference call earlier this month. "We think that has structurally changed and right now, as you know, Canadian heavy-crude differentials are probably in that 10% range, very low." Laut said high heavy-crude prices were likely to drop a bit, but Canadian heavy crude would likely trade at a discount of 22% to 24% for the foreseeable future. As a result, Wall Street analysts have begun rewarding Canadian companies that are slanted toward heavy-crude production. Analysts at Goldman Sachs, Morgan Stanley, Credit Suisse, Raymond James, Scotia Capital, BMO Capital Markets, and Canaccord Adams have all upgraded Canadian Natural to buy-equivalent ratings this year. SAN FRANCISCO (MarketWatch) -- Crude-oil futures ended 0.7% lower Friday, as concerns about energy demand superseded earlier gains from an advance in the euro against the dollar. Crude for May delivery, the most active contract, lost 53 cents to $80 a barrel in the New York Mercantile Exchange. Oil headed below $80 in electronic trading after the market close. Concerns about demand won the day in a difficult week for oil, which saw a larger-than-expected build in crude-oil inventories. For the week, oil lost 1.2%. "A bearish specter haunts the market after this week's build on inventories," said Jason Schenker, president of Prestige Economics in Austin. "So the market was looking for any cues to move lower." Investors wavered between focusing on the good news on the currency side, with the dollar losing ground versus the euro, and their demand expectations, said Phil Flynn, vice president at futures trading and research firm PFGBest Research in Chicago. A Commerce Department report early Friday showed a slightly lower revision in its estimate for fourth-quarter gross domestic product, and the "not so bullish" U.S. data raised some concern about oil demand, Flynn added. Inflation-adjusted GDP increased at a 5.6% annualized pace in the final three months of 2009, revised down from the 5.9% pace reported a month ago, even though it was still the fastest growth pace seen in six years. The revision was largely in line with expectations of economists surveyed by MarketWatch. Meanwhile, data from the University of Michigan showed consumer sentiment for March unchanged at a reading of 73.6, slightly better than estimates of around 73. The euro gained against the dollar as euro-zone members and the International Monetary Fund agreed to jointly provide aid to debt-ridden Greece if needed. But details of the plan, including the size of any financial aid, remain unclear. Investors remain concerned about Europe, however, and any bad news from a handful of countries on the periphery of the euro zone would have a negative impact on markets, Flynn added. In addition to European news, traders will be watching intently the next round of inventory data next week, as well as Friday's employment report, even though most financial markets will be closed that day in observance of Good Friday, Schenker said. The dollar index /quotes/comstock/11j!i:dxy0 (DXY 81.68, -0.44, -0.54%) , which measures the greenback against a basket of six major currencies, fell 0.5% to 81.70. A weaker U.S. currency generally bodes well for oil and other dollar-denominated commodities. Natural gas for May delivery ended 10 cents lower, or 2.5%, at $3.93 per British thermal units, while gasoline for May delivery decreased a penny, or 0.5%, to $2.2085. Polya Lesova is reporter for MarketWatch, based in Frankfurt. Claudia Assis is a San Francisco-based reporter for MarketWatch. Tamoil Joins Embattled European Refiners; Wow!!! Continued weak demand for oil products in Europe forced another refiner to halt operations this week. Libyan company Tamoil has shut its 96,000 barrels a day Cremona refinery in Italy for a month, blaming weak demand and the need to draw inventories. (Reuters) - A handful of shipping companies surging into the U.S. and Brazilian stock markets are so eager for a stake in the global movement of goods they are arriving without the vessels they need to do business. The companies are betting on the rising price of oil and Chinese demand for commodities like iron ore and coal, but investors are proving skeptical. So far the companies' businesses are name-only and their shares are taking on water. Of the three shipping companies that have gone public over the last two weeks, only one owns a ship. It leased that single ship to another company owned by the same controlling shareholder. A fourth shipping company, which does not currently have any ships, is scheduled to raise money in an initial public offering in the United States this week. A fifth company, scheduled for an IPO next week, owns three ships. "When you have what is mostly a business plan and you're raising money, there is a lot more risk in that than there would be in an existing business," said New York-based Deltec Asset Management's head of equities Greg Lesko, who helps manage $750 million. "It's not surprising to me some of these deals haven't done well. It really is very early to be considering raising money for a business that doesn't really have its operations up and running in the public equity markets," he said. Shares of drybulk shipper Baltic Trading Ltd (BALT.N) began trading at their IPO price in their market debut but are now more than 4 percent lower. Shares of crude and fuel oil shipper Crude Carriers Corp (CRU.N) also opened at their IPO price but have slipped more than 10 percent. OSX Brasil SA (OSXB3.SA), a shipbuilding and oil services start-up backed by Brazilian billionaire Eike Batista, slashed the number of shares and price range of its IPO and traded down 12.5 percent in its Monday debut. "It's just a business plan," said Josef Schuster, founder of Chicago-based research house IPOX Schuster LLC. "In the short term you must expect a tremendous amount of volatility." Schuster was formerly part of the Financial Markets Group at the London School of Economics and a member of the Chicago Mercantile Exchange. When the new shipping companies finally do get their vessels they may find themselves in a crowded market. Analysts warn that the shipping industry faces a surplus of ships. Ships ordered before the financial crisis are still being built and delivered. The worldwide drybulk fleet, for example, could easily grow 14 percent, even if half of the orders are canceled, said Cantor Fitzgerald analyst Natasha Boyden. "That's a pretty large number," she said. Tankers used as floating storage are also being put back into the transport business as the spread between front month crude oil futures prices and further out futures has narrowed, making such storage unprofitable. "Ships are ships. Industry cycles are going to be the main determinant of the return," said University of Florida finance professor Jay Ritter "Apparently a number of these companies are taking the view that there are opportunities for being contrarian and getting into the shipping business when prices are low." The uncertainty is making it tough to value the new companies, analysts said. If Alma Maritime Ltd (AAM.N) and Scorpio Tankers (STNG.N) price at the midpoint of their expected ranges this week and next, they will have a 9 percent and 17 percent premium to their respective tangible book values, IPOdesktop.com President Francis Gaskins said. Based on Monday's closing prices, Baltic Trading had a 4 percent premium to its tangible book value, while Crude Carriers had slipped to only 90 percent of its tangible book value, he said. Baltic Trading shortly after its IPO announced plans to sign charter contracts with Cargill Intl, a deal analysts said could be giving investors more assurance about revenue for a company that plans to operate in the volatile spot market. Crude Carriers Corp. (NYSE: CRU), a tanker company focusing on the maritime transportation of crude oil cargoes, announced that the Company's Chairman & Chief Executive Officer, Mr. Evangelos Marinakis, is featured today in an interview with Mr. Barry Parker of BDP1. Please find below the full text of the interview. We have with us Evangelos Marinakis, the CEO of newly listed Crude Carriers Corp. (NYSE: CRU). 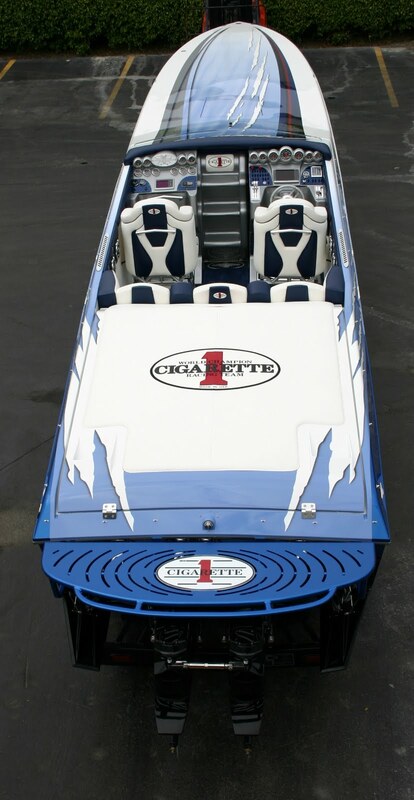 The company successfully completed its IPO on March 12, 2010 raising gross proceeds of $256.5 million. Crude Carriers Investments Corp, a company controlled by Mr. Marinakis, invested an additional $40 million in cash, on the same terms as public shareholders. Crude Carriers will use the proceeds to acquire an initial fleet of three large tankers and will focus on the transportation of crude oil cargoes along global routes. Global shipping is a highly complicated business and it is a vital link in the global economy and trade. Since 2005, shipping has gained wider acceptance among U.S. investors. Still, there is a lot to learn about the intricacies of this global business, as evidenced by some of the rumors and misunderstandings that have surrounded recent shipping IPOs. Today, we have the opportunity to interview Mr. Marinakis and we will ask him to clarify the company's profile and strategy. It is good to see you again Evangelos. Let's start with the big picture question. What is the business and investment concept behind the launching of Crude Carriers Corp? Crude Carriers is a new investment vehicle that enables investors to get exposure to the spot crude oil charter market by acquiring vessels at what we believe to be the low point of the cycle. Right now, we believe vessel prices are at very attractive levels, they are well below their five year average and they just seem to have begun to turn up. For example, current VLCC and Suezmax values are more than 40% off their peaks in 2008 and 30% off their averages since 2005. The two newbuilding VLCCs purchased from the yard a few weeks before the Crude Carriers IPO, which were transferred to Crude Carriers at cost, for example, were purchased at a cost of $96.5 million versus a price of $190 million at the peak of the market. Today, these vessels are estimated to be worth $100 million each according to Clarksons' reports. Looking forward, we believe that industry fundamentals will improve significantly, with direct impact on freight rates and asset values. Returns in shipping come both from the operation of the vessels and the price you pay when you acquire the assets. The entry point in shipping is one of the most significant determinants of returns and we believe now is the right time to invest in the crude oil tanker sector. In terms of operation, we plan to focus on the spot market, as we believe this will provide higher returns. For example, over the past five years, a spot chartering strategy resulted in a 40% premium in revenue versus a 3-year time charter strategy. The minimal debt strategy we intend to follow lowers our cash breakeven point and gives us financial flexibility for growth and dividends. We intend to distribute quarterly all net cash flow less operating reserves in the form of dividends. Crude Carriers will benefit from Capital Maritime's commercial and technical relationships with oil majors and oil traders worldwide providing it with a significant operational competitive advantage. And, we brought this deal to the market at no premium over the Net Asset Value of the fleet, which we believe was a compelling valuation especially when compared to our peers who trade at significant premiums. My family has been in the shipping business for 3 generations and I have been in shipping for all my life. We bring to the table a unique track record in vessel management and in investing in the right sector at the right time. A tangible demonstration of my belief in the prospects of Crude Carriers is that I personally invested $40 million at the same valuation as the other investors, fully aligning my own interest with theirs. Let's talk about your fleet. How many ships do you own right now? We all know that in the tanker business, the young age of your vessels is a distinct competitive advantage. What does your fleet look like? Unlike other shipping sectors, the tanker sector is highly regulated due to the nature of the cargoes we carry and charterers are particularly demanding when it comes to vetting. So, indeed, the age and modernity of our fleet, as well as the reputation and track record of our manager, Capital Maritime, are distinct competitive advantages. Our initial fleet will consist of three tankers with a weighted average age of less than one year, compared to the industry average of 9 years and considerably younger than any of our public peers. Our vessels are state of the art, high specification vessels built at the best shipyards in the world and perfectly suitable for our business. Our initial Suezmax vessel is a 2006-built 163,000 dwt crude tanker built at the Daewoo Shipyard in Korea. According to industry data, there are only four Suezmax vessels built to-date with similar high specification features. 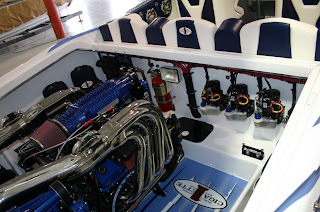 These features include the capacity to navigate through severe ice conditions (Ice Class 1A), the capacity to transport most oil products as the vessel is fully Epoxy Coated with stainless Steel Coils, and increased maneuverability due to her Bow Thruster and Controllable Pitch Propeller. We expect to take delivery of this vessel within the next 10 days. We also have agreements to acquire two brand new sister VLCCs of 298,500 dwt each currently completing construction at Universal Shipyard in Japan. 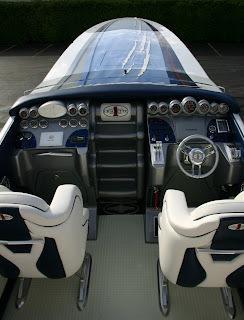 We expect to take delivery of the first vessel within this week and the second vessel towards the end of June 2010. So we will very soon have two vessels in the water earning income for the company and by the second half of June we expect to have the full fleet in place, benefiting from their earning capacity. We expect to pay our first dividend after the end of the second quarter of 2010.
Who are you buying your vessels from? How did you determine the price to be paid for them? The two newbuilding VLCCs were contracted shortly before the IPO from an unrelated third party for $96.5 million each and we are transferring them to Crude Carriers at the same cost, plus a one time 1% sale and purchase fee, which is a standard industry commission for sales and purchase transactions. Capital Maritime, an affiliated company controlled by me, is selling the Suezmax to Crude Carriers. The Suezmax will be acquired for $71.25 million which reflects the average of two valuations from independent shipbrokers, thereby producing an objective benchmark. But let me elaborate here a bit more, to highlight the value and benefits of this transaction to the shareholders of Crude Carriers. Capital Maritime was able to acquire the two newbuild VLCCs on behalf of Crude Carriers at prices which are almost 50% less than peak prices seen recently. And Capital Maritime bought these vessels without the contingency of the IPO taking advantage of an attractive market opportunity. Usually buying assets subject to IPO or equity issue means that you have to pay a premium for holding the option. We did not pay this premium. At present, based on market sources, the current market value of these VLCCs has appreciated. As these two VLCCs will be contributed to Crude Carriers at their acquisition price and not at their current market value, the shareholders of Crude Carriers receive the full benefit of the run-up in price. What is the relationship between Crude Carriers and Capital Maritime and how can this benefit Crude Carriers? The relationship with Capital Maritime is actually a significant competitive advantage for Crude Carriers. Capital Maritime will serve as the technical and commercial manager for our fleet and will perform other administrative functions. It is common in the shipping industry to entrust these operations to an affiliated party benefiting from its expertise, synergies and economies of scale. 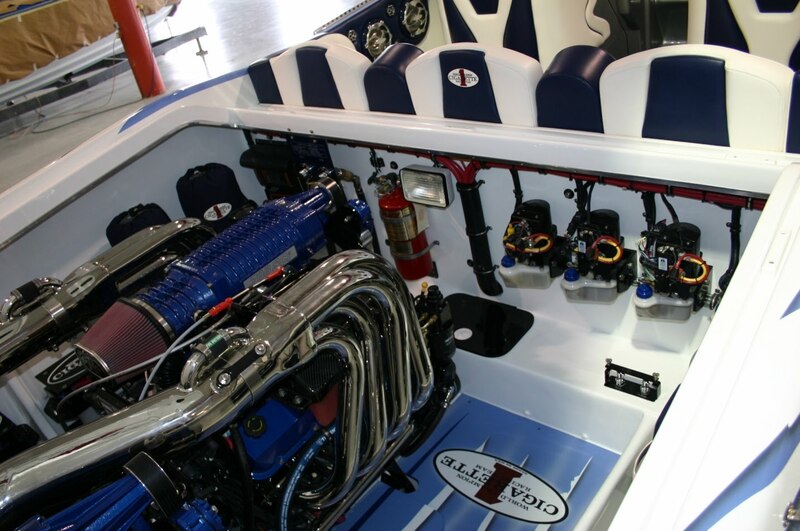 Currently Capital Maritime is one of the few companies worldwide which is approved and vetted for business with a number of oil majors and its award winning commercial and technical performance has been recognized widely in the industry. Currently, Capital Maritime is the largest chartering counterparty to BP for product tankers. So, Capital's expertise, network, resources and relationships will be at the disposal of Crude Carriers enabling it to draw significant benefits for its operation and growth. The fees paid to Capital are well within industry standards and, importantly, overall costs are on the low end of our peer group. Let me stress here that shipping is a global and highly competitive business, with a lot of players and with a significant amount of information and transparency. Crude Carriers has fully disclosed and will continue to provide a transparent and analytical breakdown of all fees to be paid for these services, instead of providing a single lump sum figure. Industry benchmarks and standards for such costs, fees and commission are readily and easily available, so anyone can compare them. Please bear in mind that companies which outsource their commercial and technical management are also paying fees and commissions but often do not disclose them but it shows up in their overall operating performance. Capital Maritime will be in a position to offer a competitive cost structure due to our hands on approach, accumulated experience and tested structure but also by virtue of the very low age of the Crude Carriers fleet. One needs only to look up the cost structure of the Capital Product Partners L.P. fleet, which is also under management by Capital Maritime. You will find that their OPEX and administrative costs are among the lowest in the industry. Shipping companies that have a stable dividend policy tend to seek longer term charter coverage for their fleet which translates into predictable cash flows and thus predictable dividends. With Crude Carriers you follow a completely different approach, focusing on the spot market, and yet you expect to have a generous dividend payout. How can this be possible? We have a clear dividend policy. We intend to distribute to investors all net cash flow less operating reserves. We expect to pay our first dividend after the end of the second quarter of 2010. As I mentioned before, the spot market, especially for the large tankers, has historically produced higher returns. For example, over the past five years, a spot chartering strategy resulted in a 40% premium in revenue versus a 3-year time charter strategy. Our zero to minimal debt strategy means no covenant issues, no amortization of debt and minimal financial expenses. It lowers our cash breakeven point and sets a low hurdle for generating cash profits, even if freight rates are lower. This underpins our dividend policy, as our intention is to distribute to investors all net cash flow less operating reserves. We expect that at current spot rates we should be able to pay out substantial quarterly dividends thereby rewarding our shareholders. At the same time, we have access to a $100 million competitively priced revolving credit facility with Nordea bank which we can use opportunistically for acquisitions. This credit facility gives the Company additional flexibility to acquire assets through accretive acquisitions, when an attractive opportunity arises. Why do you have Class A and Class B Shares? Are your shareholders getting a fair treatment? This shareholding structure is common in the shipping industry. Class B shares have higher voting rights enabling the quick decision making required in the highly competitive global shipping markets. However, all shares regardless of Class represent the same economic interest in the Company and get the same economic benefits. I would like to remind you that I personally invested $40 million at the same valuation as the other investors, fully aligning my own interest with theirs. More importantly, our shareholders should know that if I sell a single share below the number of shares I was allocated for my $40 million contribution at the IPO, all my Class B Shares will automatically convert to common shares and I will not have higher voting rights. Under my leadership I expect Crude Carriers to become one of the leaders in the crude tanker industry and I am fully committed to its development and growth for the benefit of all shareholders. You are incorporated in the Marshall Islands. Is this normal industry practice? Having the Marshall Islands as our legal domicile optimizes the operational and tax structure of our company for the benefit of our U.S. shareholders. The Marshall Islands are a Protectorate of the United States and there are special treaties between them. If you look at the shipping companies listed on U.S. Stock Exchanges you will see that many of them are domiciled in the Marshall Islands. Greece has been in the spotlight with its financial and economic crisis. How does this affect your business? I am optimistic that with the measures the Greek Government is taking, Greece will ultimately pull through possibly with the support of the European Union or the IMF. But let me stress that our business is not dependent on developments in the Greek economy. We derive our revenues transporting crude oil cargoes along global trade routes, so we depend on developments in the global energy markets. Please click the link below to access a PDF version of the interview. Barry Parker is a financial writer and analyst specializing in the maritime sector. His articles appear in a number of prominent maritime periodicals including Fairplay, Seatrade, Lloyds Shipping Economist and Janes Transport Finance. Crude Carriers Corp. is a newly formed Marshall Islands corporation focusing on the maritime transportation of crude oil cargoes. The company's common shares trade on The New York Stock Exchange under the symbol "CRU". CHEYENNE, Wyo. — Increased crude oil production in the Gulf of Mexico and North Dakota more than offset declines elsewhere last year to result in the first annual increase in U.S. oil production since 1991, according to the U.S. Energy Information Administration. Domestic oil production in 2009 averaged 5.32 million barrels a day, up 7.4 percent from 4.95 million barrels a day in 2008, according to the federal agency's Short-Term Energy Outlook report for March. Last year saw the highest level of domestic oil production since 2004, when the daily average was 5.42 million barrels. Production had been declining steadily since 1991's daily average of 7.42 million barrels. The report forecasts production to continue growing for at least the next couple years, with increases of 3.9 percent predicted in 2010 and 0.3 percent in 2011. Last year's increase resulted mainly from drilling investments made by energy companies before prices collapsed in 2008, said Tancred Lidderdale, an analyst in the Energy Information Administration, part of the U.S. Department of Energy. The federal deepwater reserves in the Gulf of Mexico have been known about for years but only last year were sufficiently tapped to significantly boost production. "It takes anywhere from five to 10 years to develop new deepwater, offshore fields," Lidderdale said Wednesday. Through October, the most recent month for most specific data, federal deepwater production in the gulf was up 30 percent, an increase of 107 million barrels, compared with the first 10 months of 2008. In North Dakota, production was up just under 30 percent, or 15 million barrels, over the first 10 months of 2009. Most came from the Bakken shale in the western part of the state. New drilling technologies such as improved methods of hydraulic fracturing — pumping a pressurized mixture of water and chemicals underground to split rock — have enabled production in the previously unproductive formation. Higher oil prices starting around 2004 spurred the kind of investment that made developing areas like the Bakken feasible, said Rayola Dougher, senior economic adviser for the American Petroleum Institute. "As the price of oil went up, you were able to access resources that were more difficult and expensive to get to," Dougher said. Other major oil-producing states with increased production through October included Louisiana, up 0.85 percent; Oklahoma, up 3.25 percent; Mississippi, up 4.27 percent; and Utah, up 5.9 percent. Production declined in several other states. Among them were Alaska, where production was down 4.5 percent on the North Slope and 5.3 percent elsewhere; Texas, down 3.75 percent; California, down 3.14 percent; Wyoming, down 4.3 percent; Montana, down 12.45 percent; Colorado, down 3.36 percent; and New Mexico, down 0.05 percent. SINGAPORE (Dow Jones)--Crude oil futures remained above $80 a barrel in Asia Tuesday on expectations that improving financial markets will boost demand for oil, but gains are likely limited due to an overhang of crude supply, some analysts said. "The market tends to huff around the $80 level," said Victor Shum, an analyst at Purvin & Gertz in Singapore. "There is no question that on a global basis, oil demand has picked up compared with a year ago," he said. "But the supply of oil has also been increasing at the same time." On the New York Mercantile Exchange, light, sweet crude futures for delivery in May traded at $81.52 a barrel at 0350 GMT, down 8 cents in the Globex electronic session. May Brent crude on London&apos;s ICE Futures exchange fell 8 cents to $80.46 a barrel. Data due Wednesday from the U.S. Department of Energy is expected to show a rise in crude inventories. Stockpiles are expected to rise by 1.2 million barrels, according to the average estimate of eight analysts polled by Dow Jones Newswires. There have been strong attempts by investors to push the price of crude oil above $84 a barrel, Shum said. However, most of that has been driven not by improving fundamentals but by speculators chasing after returns, he said. "The push to higher prices primarily comes from a lot of cheap money," he added. Oil prices will likely take cues from the direction of financial markets in the coming days, said Jim Ritterbusch, president of Ritterbusch & Associates, in a note to subscribers. U.S. stocks rose overnight to 17-month highs after lawmakers voted late Sunday to approve a health-care overhaul bill. "Downside price follow-through below the $80 (a barrel) mark will prove difficult without major assistance from the financial markets," he said. "A sustained price correction will be extremely difficult with the stock market posting new highs." Nymex reformulated gasoline blendstock for April--the benchmark gasoline contract--fell 37 points to 225.25 cents a gallon, while April heating oil traded at 208.45 cents, 8 points higher. ICE gasoil for April changed hands at $666.75 a metric ton, up $4.50 from Monday&apos;s settlement. 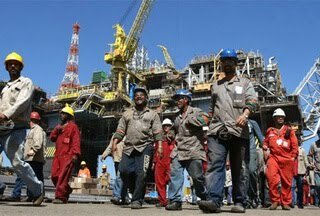 Nigeria's oil sector employees have given the government an ultimatum to crack down on those behind the killings of two oil workers in the Niger Delta. "We have issued a 14-day ultimatum to government and the security agencies to fish out the killers of two of our members," AFP quoted Bayo Olowosile, secretary of the Petroleum and Natural Gas Senior Staff Association (PENGASSAN), as saying on Tuesday. The workers' bodies were found in Nigeria's volatile oil-rich South a week after unknown gunmen kidnapped them. "PENGASSAN ...calls for full investigation of this cruel murder and the resultant prosecution of those responsible within 14 days, failing which our association may be compelled to take whatever action deemed appropriate to oblige the government to fish out the culprits," the union's representative added. Nigeria's oil sector had previously warned of a strike, should the killings by local fighters continue, they said. The country has been suffering from violence in the Niger Delta where foreign oil companies have been targeted by fighters seeking a fairer share of Africa's largest oil reserves. Nigeria's acting president included some surprises in his new cabinet one week after sacking the entire Government in Africa's leading oil producer. Goodluck Jonathan included a newcomer from Goldman Sachs and promoted the junior oil minister in what was seen as an attempt to return to a reform agenda after months of drift and paralysis in the crisis-stricken nation. Only nine former ministers look set to be reappointed, among them Odein Ajumogobia, previously junior oil minister, who looks likely to be promoted after his former boss Rilwanu Lukman was omitted. The acting president moved to assert his authority over the fractious Government, which has been paralysed since November, as President Umaru Yar'Adua has been suffering from a mysterious illness and has not been seen in public. Mr Jonathan has had to struggle for control with a cabal surrounding the first lady, Turai Yar'Adua, amid fears that a political crisis could worsen sectarian violence and undermine efforts to extend a ceasefire in the oil-producing Niger Delta. Mr Jonathan produced a list of 33 names for the Senate to consider, and his only obvious concession to the powerful northern block around Mr Yar'Adua was the naming of his nephew Murtala. Further names are expected to be announced to bring the Government back up to its full complement of 42 ministers. No portfolios have been announced. Senate approval is expected before Easter. "All of this will be very closely watched by investors," Razia Khan, head of Africa research at Standard Chartered, told Reuters. "Appointments will be key to determining whether the aim is to kickstart reforms ... or whether this is just politics returning to centre stage," she said. The power struggle between supporters of Mr Yar'Adua, a Muslim northerner and Mr Jonathan, a Christian southerner, has dangerously mirrored north-south sectarian tensions in the country itself. Yesterday's list of names was a reminder of the complexities of balancing interest groups across 36 states and numerous ethnic groups in Africa's most populous country. In addition to the sop to the Yar'Adua clan, was the inclusion of Sanusi Daggash, a minister of planning in the administration of former president Olusegun Obasanjo – another kingmaker in the background of the power games in the capital, Abuja. Early interest among analysts focused on the choice of Olusegun Aganga, a London-based managing director at Goldman Sachs. His inclusion appeared to signal the acting president's intent to move ahead with critical banking reforms and bring in new-blood to what was seen as Yar'Adua's failing administration. The nomination of Mr Agang – who heads up Goldman Sachs' hedge fund consulting services in London – comes as Nigeria is set to test its strength with foreign investors with a planned $500m debut global bond. The extended power vacuum has seen renewed violence in the Niger Delta where last week car bombs set off by the region's leading militant group MEND signalled the end of a fragile ceasefire. It has also come as sectarian violence in the central city of Jos has claimed the lives of at least 400 people in two bouts of mass killings this year. The central Plateau State has become an explosive fault line in the deeply divided country with Christian and Muslim groups caught in a spiral of violence. The first head of state from the Niger Delta, Mr Jonathan has attracted strong support from the US and Europe, which are both heavily reliant on Nigerian oil. With Russia and China stepping up their involvement in Nigeria's massive oil and gas reserves, there is cautious support for the former vice president and Washington has put behind-the-scenes pressure on key figures in the country's political elite to allow Mr Jonathan to govern for the next year ahead of polls, expected in 2011. However, the ruling PDP Party has called on the acting president not to run in future elections, and he faces strong opposition from the majority of powerful state governors should he be tempted to try. Thanks Ash for the great tanker Pic!